Episode 3 of Big Beach Builds, “Captain’s Paradise,” could not have been more appropriately named. 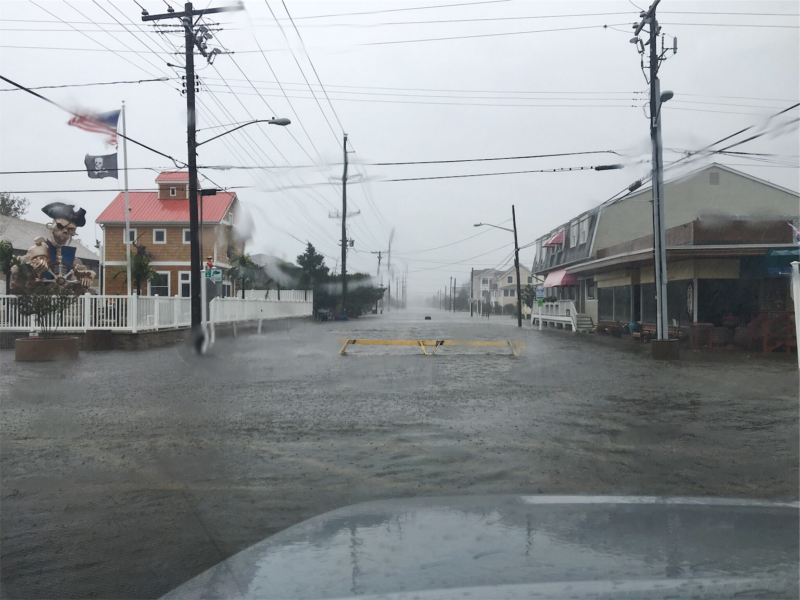 We filmed this episode in the middle of a severe storm that flooded much of the Delaware coastline, turning the roads where we were working into rivers. 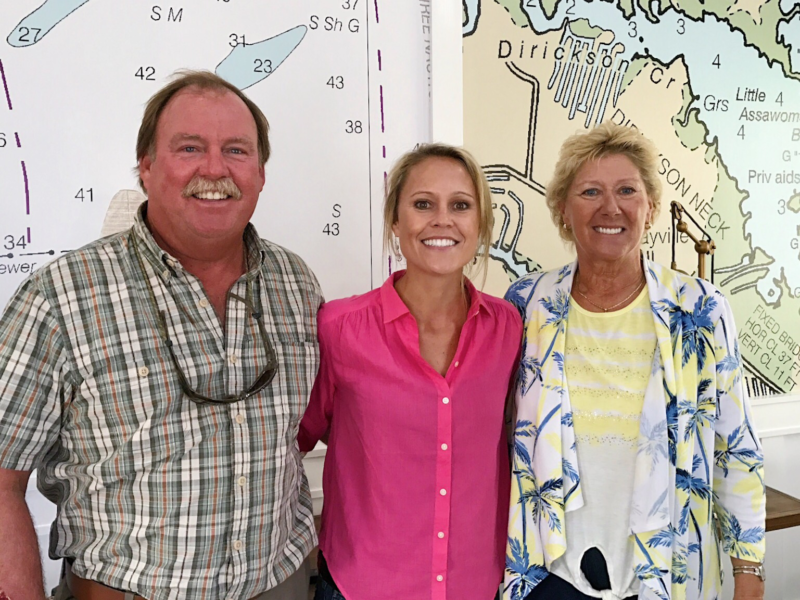 Though a bit cumbersome, it was a fitting atmosphere to build a beach haven for former ship captain, Keith, and his wife, Amber. 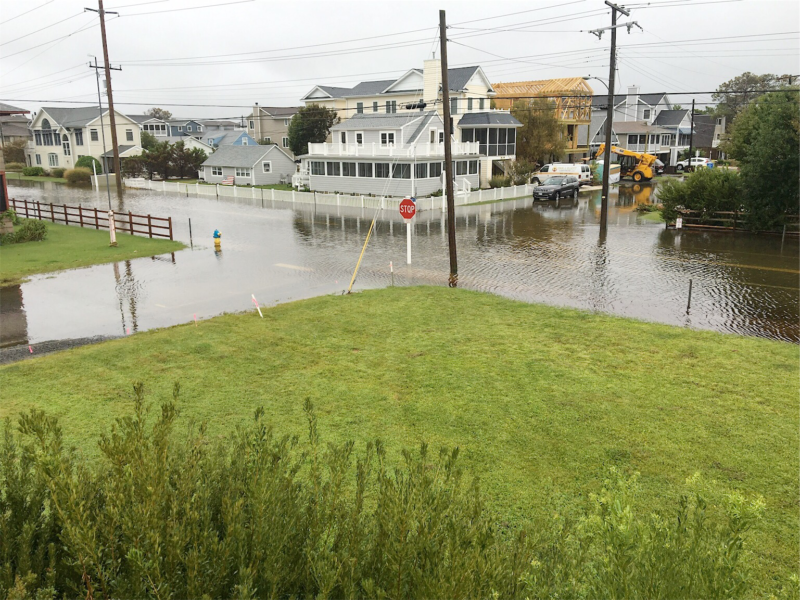 Keith and Amber have a long past and deep roots here in historic Bethany Beach (where I live, too). 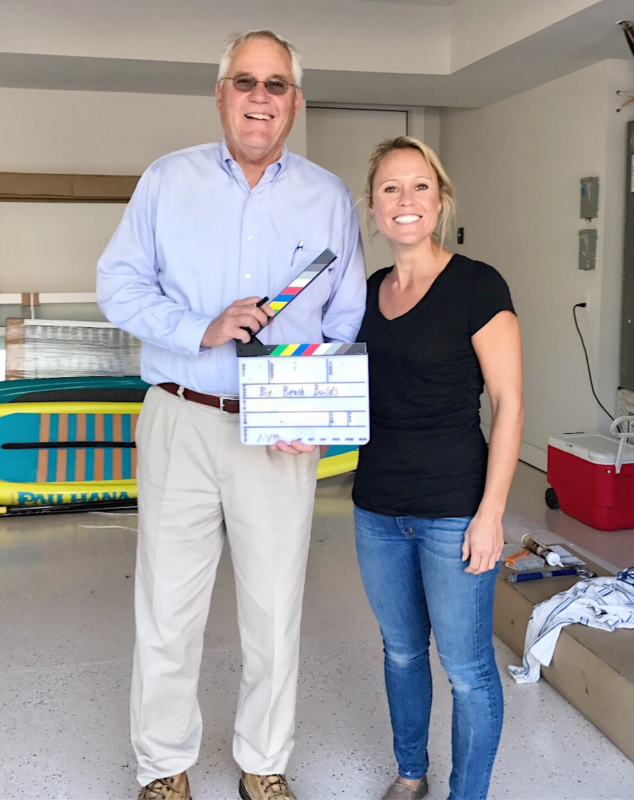 Their relationship started in Bethany Beach many years ago when Keith was a lifeguard and spotted Amber on the beach one day. Since then, the couple has spent as much time here as they possibly can, and even named their daughter Bethany! 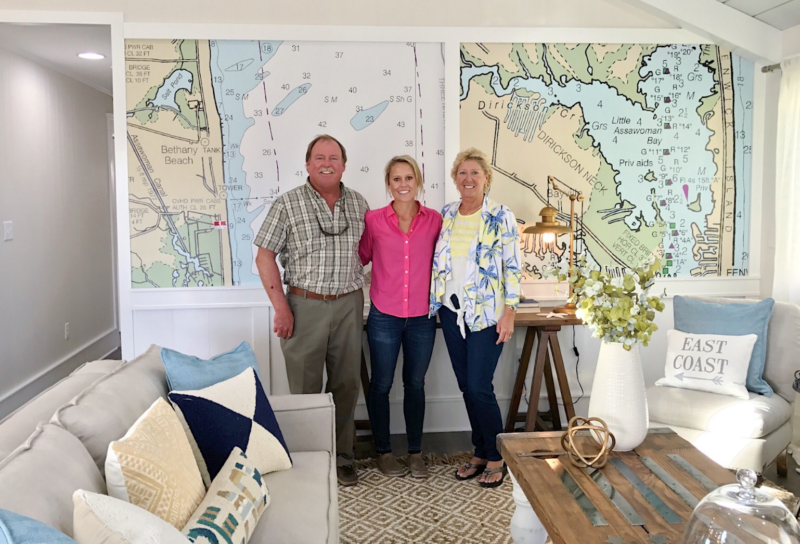 It’s always been their dream to own a home in Bethany Beach and they finally got their opportunity a couple of years ago. 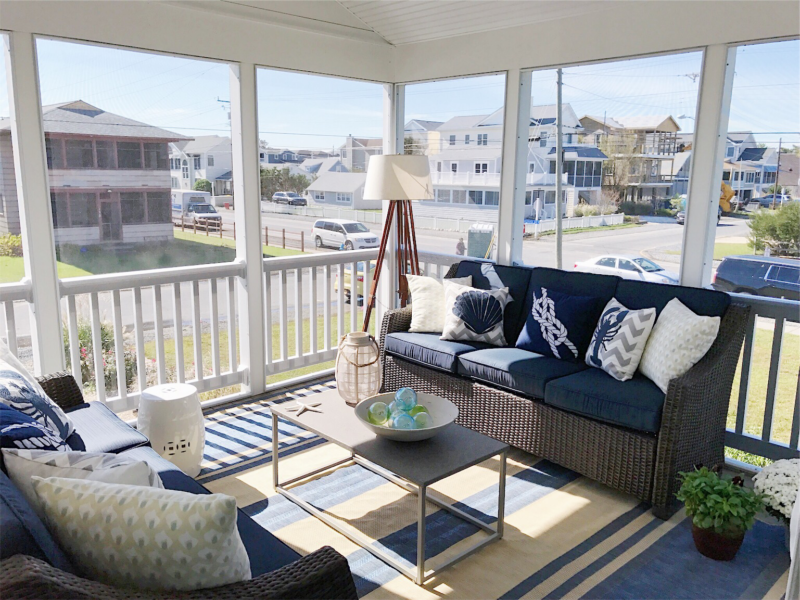 This classic beach home is just one block from the beach, and also happens to be located on the street where their life together first began. Unfortunately, the home hasn’t quite lived up to their expectations. The storage area and outdoor shower underneath the house didn’t stand up well against the harsh elements of seaside living (especially given their proximity to the ocean). Furthermore, the shared living space wasn’t conducive to large family gatherings. 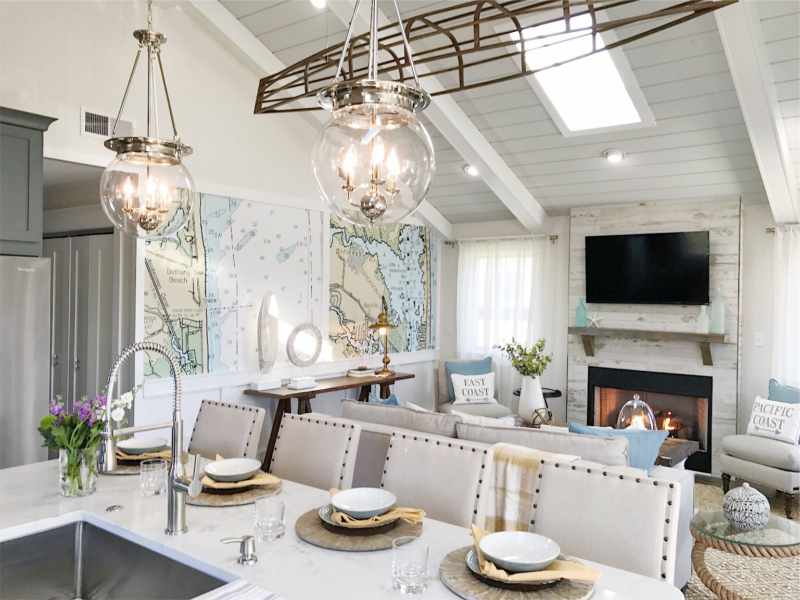 It was my job to correct this home’s structural and layout issues to create a relaxing, maritime-inspired beach home fit for a ship captain and his best mate. One of my favorite design elements from this build was this boat frame we suspended from the ceiling. This large, newly opened area craved something structural and visually interest that would also draw the eye up to the lofty cathedral ceilings. 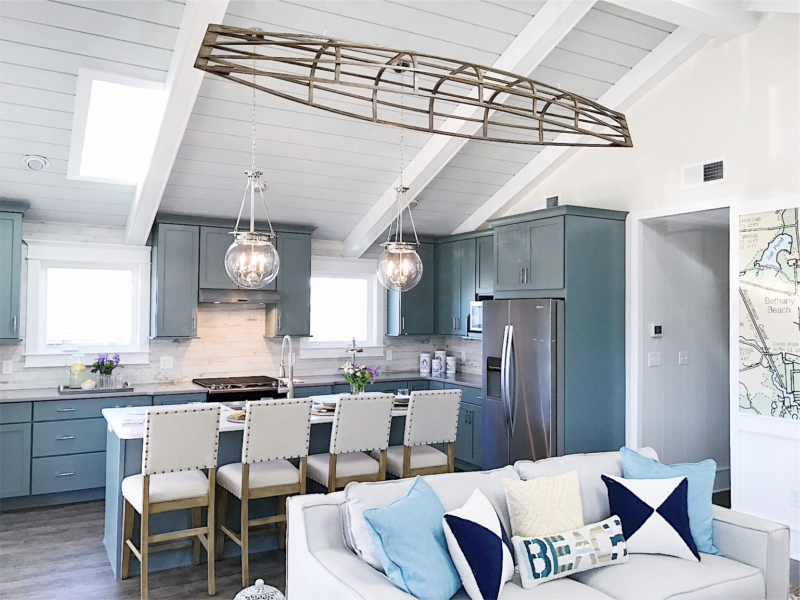 This gorgeous boat frame fit the bill perfectly, with an open, airy quality that tied back to our nautical theme. I also loved that it was a little nod to Keith’s past as a ship captain. 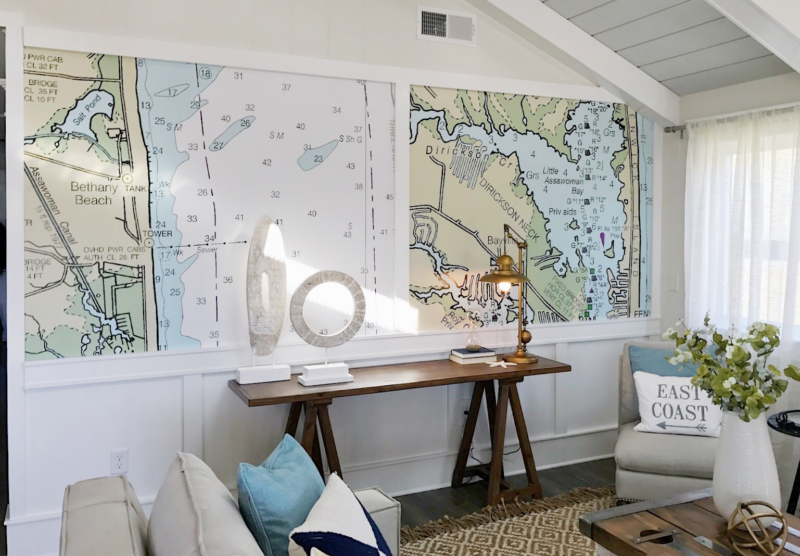 It’s always my goal to select art that I think the homeowners will connect with, which is why this large Bethany Beach map was a highlight of this transformation. We had a large, empty swath of wall near the living room area, and this custom wallpaper filled it beautifully. The color palette tied in seamlessly with the rest of the house and I adored how the map almost looked abstract from a distance. I hope every time Keith and Amber look at it, they’re reminded of where and how their story together began. Problem: Amber and Keith loved their screened-in porch and spent much of their time at the house there. But they weren’t using the open portion of the porch much at all. 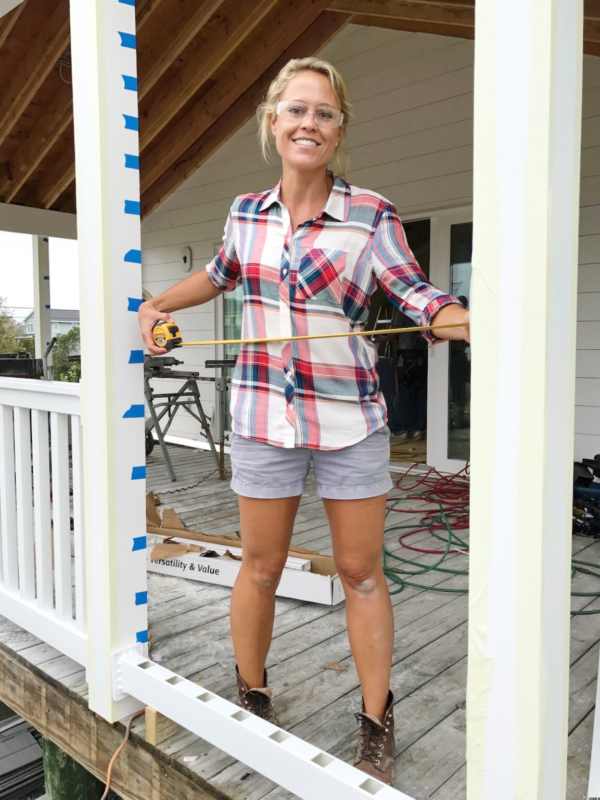 Additionally, the humidity, salt air, and storms that come with being that close to the ocean had compromised the exterior wall between the porch and the house. 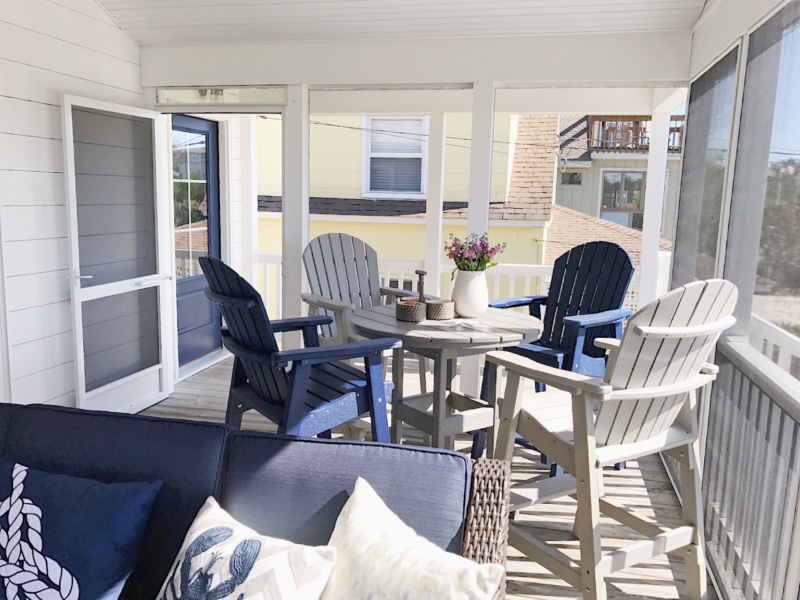 The couple longed for a covered outdoor space for entertaining that would also protect the home from harsh coastal weather. 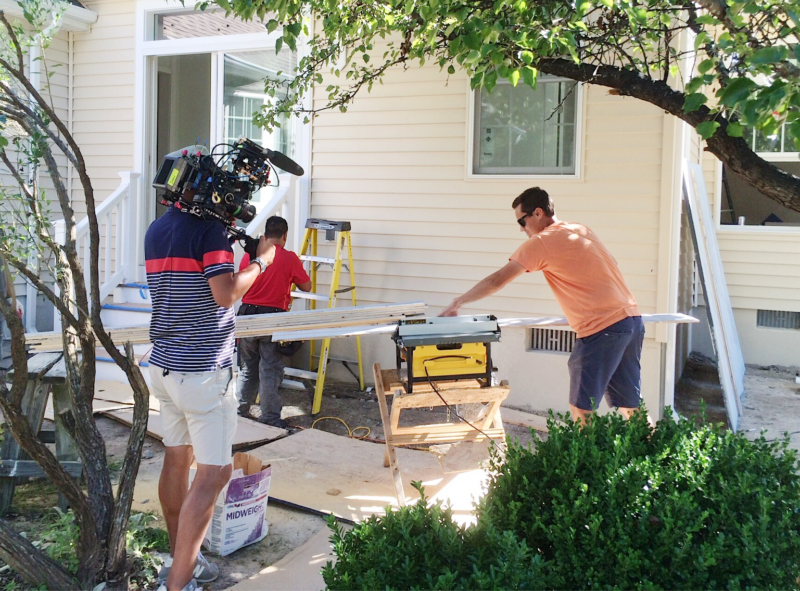 Solution: I screened-in the entire front porch, including the part that was originally uncovered (and unused). I used weather-safe materials for the screening and decorated with weather-proof furniture that would stand up to the rough beach weather. To give the space a loftier feel, we added cathedral ceilings – a great way to circulate cool ocean breezes. I also replaced the door between the porch and the home with a wider, reinforced glass door. In addition to being weather resistant, the larger door opening provides a more seamless flow for easy indoor/outdoor living. Problem: Amber loves to have large gatherings of family and friends at the beach. However, the kitchen, where Amber usually is while hosting, was closed off from the rest of the living space. Additionally, the front door was in center of the main living area, disrupting the traffic flow of the entire space. Solution: It was a no-brainer to take down the wall between the kitchen and the living room. This creates a completely open floor plan and an ideal space for day-to-day beach living and entertaining. 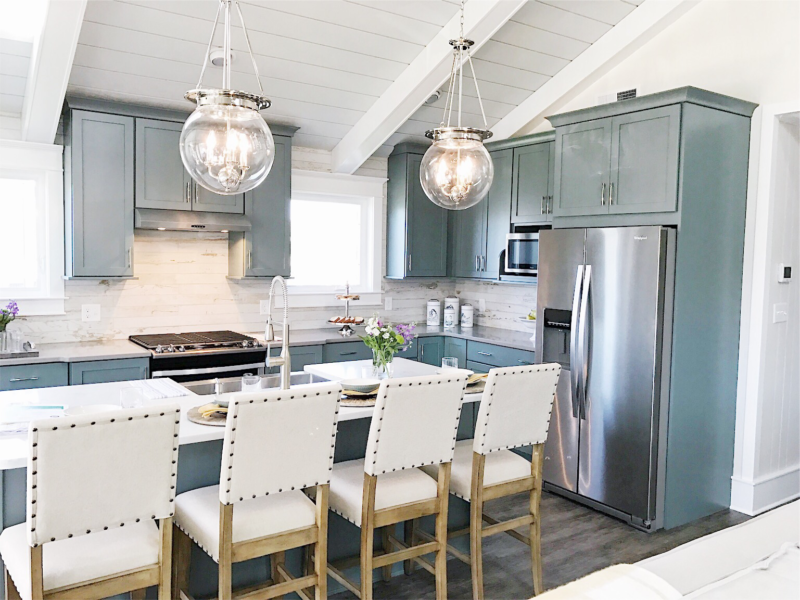 The kitchen also needed a complete renovation, so I brought in new cabinets, modern appliances, statement lighting, gorgeous new floors, and a large island where people can gather while Amber cooks. Lastly, I moved the front door to the corner of the living room so it no longer divided the new space. 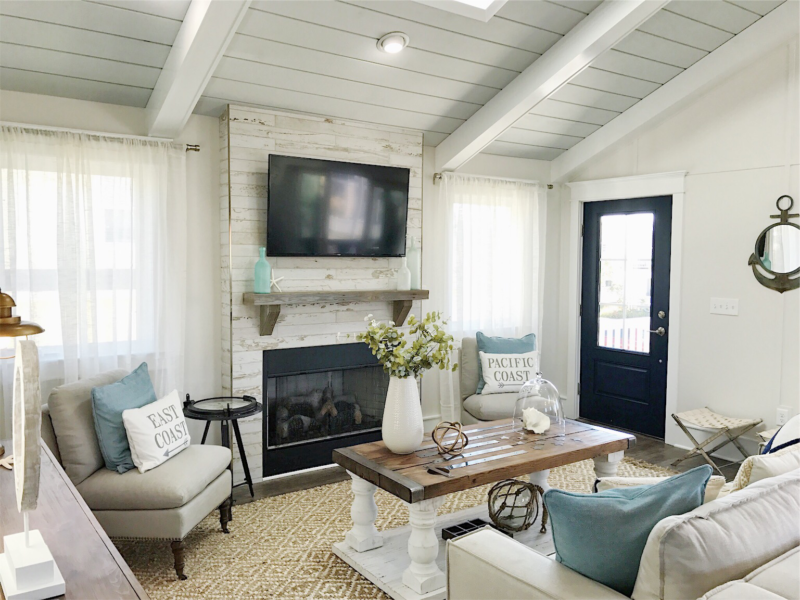 Problem: The home originally had an awkward space off the living room that didn’t serve a useful purpose. There was no way to close it off for privacy, but it wasn’t open enough to be used as shared living space. What the couple really needed was an extra bedroom for overnight guests. Solution: The first thing I did was close up the opening between the extra room and the living room. 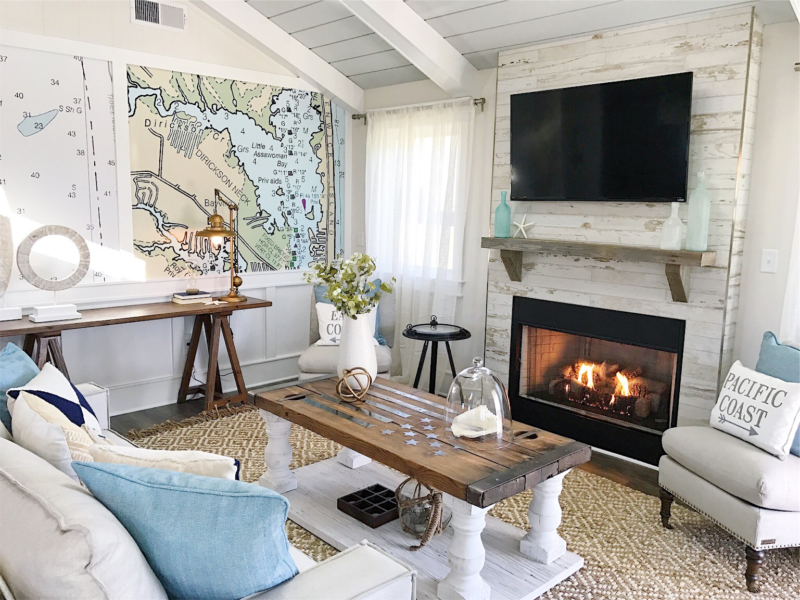 I reused salvaged wood paneling from the demolished living room wall to ensure that the new wall would match perfectly (less waste means it’s sustainable, too!). 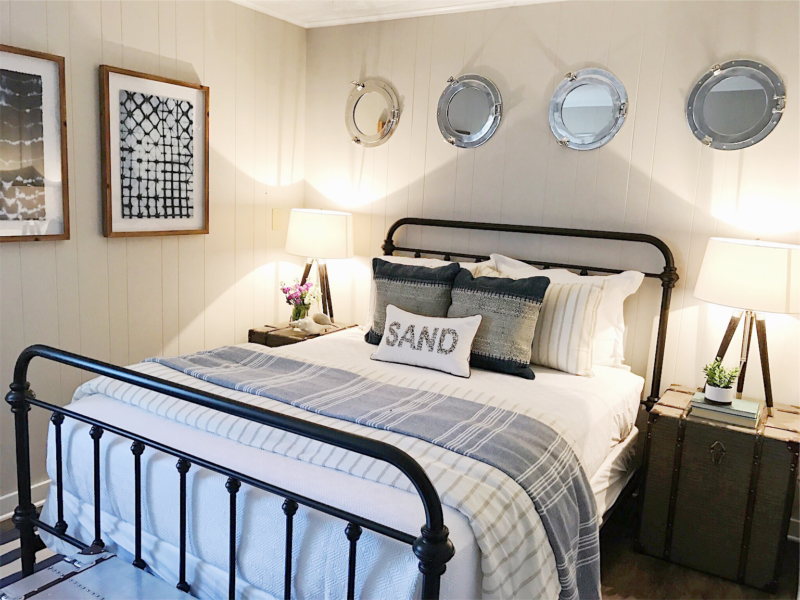 Once the wall was complete, I created a proper bedroom with all the necessary amenities – including a closet – and a touch of nautical decor. Problem: The open-air storage area underneath the home was completely vulnerable to extreme weather conditions. Amber and Keith often returned to their home after winters away only to find that their belongings rusted and ruined by the weather. This made them hesitant to use the space, which they very badly needed. The outdoor shower was also located beneath the house and suffered from the same exposure to the elements. 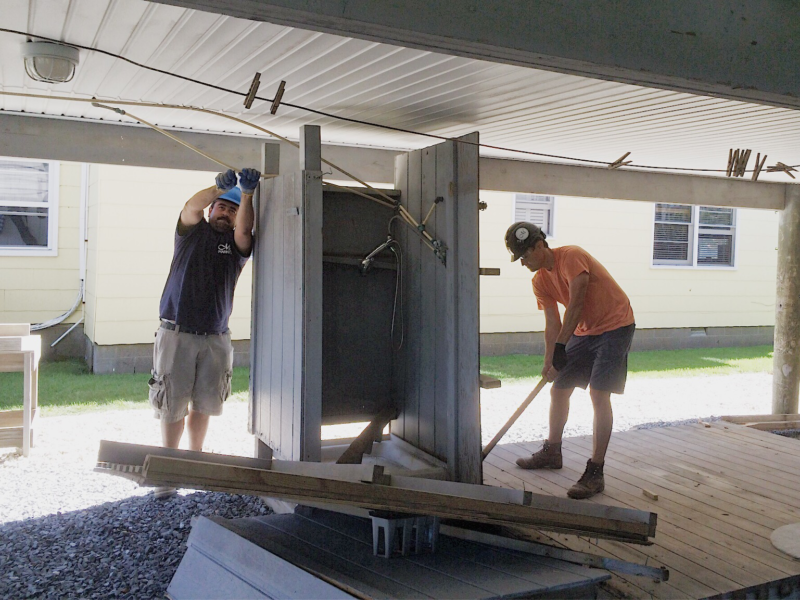 Solution: A new storage area was an absolute must, so I began by reinforcing the joints to ensure the space could withstand the coastal climate. I always look for ways to reuse, rather than throw away, old elements of a house, so I repurposed the former kitchen cabinets as storage in this new area beneath the house. I also built a new outdoor shower with the same resilience the rest of the space now had. As a final measure of protection and privacy, I installed a fence around the entire space. I like to create custom pieces for my clients when possible, so for this project we built a coffee table. 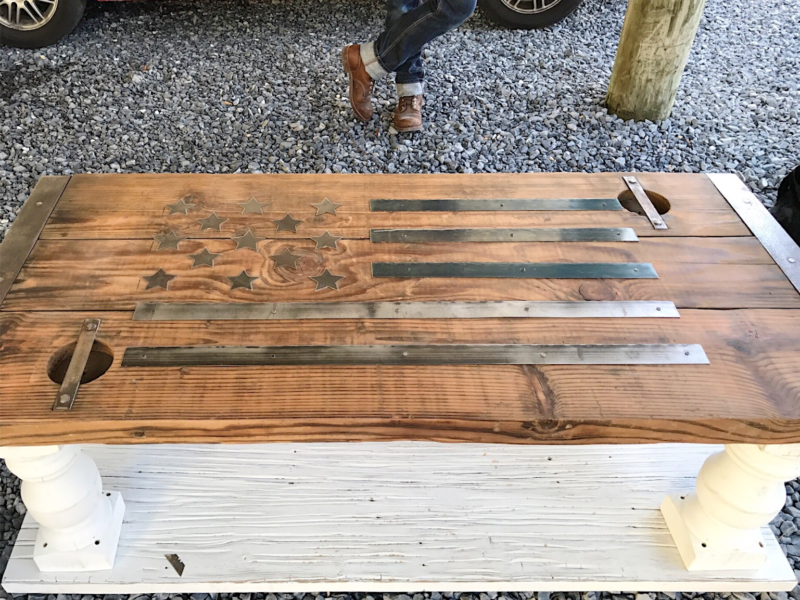 We made the top from beautiful stained wood, over which I laid metal pieces in the shape of the American flag. I gave the wooden bottom and turned legs a nice whitewash to make it feel as though it had been weathered by the salty sea air. 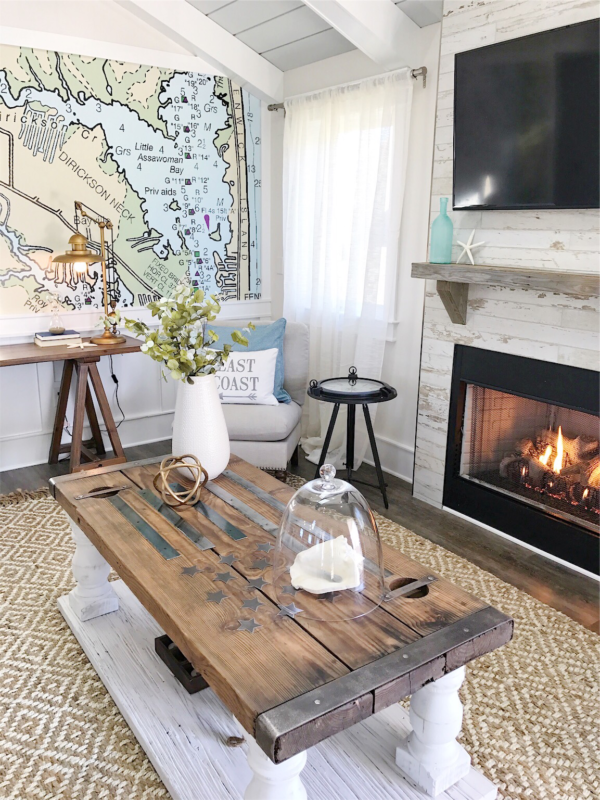 This table was the perfect finishing touch for this captain’s paradise. I always love to include my family in as much as I do as possible, so it was such a treat to have my brother and my dad with me on this build! P.S. Read my Episode 4 recap next, and don’t miss my recaps for Episode 1 and Episode 2!